Facilities available at Fool Hollow Lake Recreation Area. Mornings: 8 a.m. to 10 a.m. Afternoons: 2 p.m. to 4:30 p.m. Mornings: 8 a.m. to 4:30 p.m.
Campers: If you have a reservation, proceed to your campsite. We will contact you during the day with your tags. If you do not have a reservation, proceed to the Redhead campground. Choose a site that is not reserved. You may either return to the office when it is open or utilize the self-pay option for one night. Maps are located on the door with self-pay envelopes. Day Use: Utilize the self-pay option. Envelopes and maps are located on the entrance road door. Price is $7.00 per vehicle. This recreation area has modern, handicap accessible restrooms. A dump station is available for registered campers from May 1st through October 15th. Hot showers available at all camping loops at no extra charge for registered campers. Accessible. Nice spots for your gathering or a picnic are available on both sides of the lake. Single lane boat launch ramps are available on the east and west sides of the lake. Maximum of 10 H.P. gasoline engines are allowed. Non-motorized watercrafts are welcome and may launch at either boat ramp. All boating laws apply. Stay alert: Venomous snakes and insects inhabit the area. Do not feed the animals and store all foodstuffs in secure containers or in your vehicles. Waterfowl: (viewing varies with time of year) mallards, Canada geese, various species of divers & dabblers, great blue heron, snowy egret, American egret, white-faced ibis. Neo-Tropical and Passerine species: (viewing varies with time of year) Stellar’s jay, lesser goldfinch, numerous species of bluebirds, acorn woodpeckers, nuthatches and red-shafted flicker. Raptors: Bald eagle (winter), osprey (summer), American kestrel, northern harrier, goshawk, and red-tailed hawk. Common Mammals: Eberts squirrels, rock squirrel, gophers, skunk, raccoon, beaver, and muskrat. Sightings of elk, bobcat, coyote and deer are not uncommon. Snakes do inhabit the area, including the western diamondback snake. The Amphitheater and Interpretive Area is located on the east side of the recreation area between the tent area and RV area. Weather permitting, join us for an interpretive program. 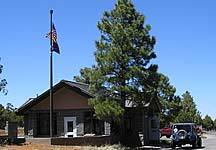 Ask in the Ranger Station about current programs; topics include Smokey Bear, elk, wildfire, birds, or special programs. Get a whole new view of Fool Hollow Lake by renting a canoe or kayak! They also offer paddle board rentals, bait/fishing supplies, snacks and drinks. Help us protect this beautiful area. Please familiarize yourself with the recreation area rules. If you have a camping reservation you must make every effort to be in the park by 10 p.m. If there is a problem/emergency and you will not be able to make it by 10 p.m., please call (928) 537-3680 before 4:30 p.m. to make arrangements. We will do our best to assist you. All vehicles arriving for a reservation must have in their possession a confirmation notice with name and campsite. Identification will be required at check-in regarding reservations. If you make the reservations for multiple sites/people, you must ensure that each party receives a confirmation slip. All rules and regulations are strictly enforced. If you are not sure, please ask a ranger. The area contains natural hazards. Please enjoy the recreation area with caution. Especially observe your children! At the discretion of the recreation area manager, campsites are limited to a maximum of two vehicles. Motorized vehicles in tow may count as the second vehicle. You must park in your assigned campsite. All extra vehicles must park in the overflow parking; this is a fire lane/emergency vehicle standard. All vehicles and trailers must remain on the paved portion of the campsite. Occupancy: two vehicles – six adults (14 years and older) with a maximum of 12 persons total. When feasible, a third vehicle may join a group for an additional fee of $15.00 per night. The third vehicle may have to be parked in an overflow parking lot. Occupancy levels cannot be exceeded. Additional persons, beyond 12 total, in increments of one to 12, must pay for and occupy another campsite. Quiet hours are from 8 p.m. to 7 a.m.
Day Use hours are 7 a.m. to 10 p.m.
All Day Use visitors must depart the campground by 10 p.m.
At all times noise levels (including music) must not be heard in neighboring campsites. No generators allowed at any time. All vehicles are restricted to paved roads and must be “street legal” (registered and insured) to operate within the recreation area. (This includes ATVs, RTVs, side by sides, motorcycles, scooters, etc.) These vehicles may be charged if operated within the recreation area. Damaging, defacing or removing natural features, rocks, vegetation, artifacts or public property is against the law. No gathering of or chopping trees for firewood. This includes dead, downed trees and snags. Campfires are restricted to fire rings, must be kept small, attended at all times and doused thoroughly when done. “Red Flag” (fire restrictions) may preclude wood and charcoal fires. Observe posted signs and/or check with rangers. Water for pets must be available. Sites must be kept clean and litter free at all times. Trash must be deposited in dumpsters provided at each camping loop. No glass beverage containers are allowed in the recreation area.